At this very moment, from Spring to Midsummer is taking place one of the largest animal migrations on the planet, the Sardine Run, a survival struggle turned into a spectacle of nature. In this choreography, sardines are merely supporting actors and the real stars are the thousands of predators that come to feed on a huge mass of sardines, the biggest shoal of fish that can be found in the ocean. In this migration it is possible to witness powerful shark attacks, another demonstration of the intelligence of dolphins, the voracity of whales or daredevil seabirds getting into a hostile territory where they compete with the giants of the ocean. Welcome to the Sardine Run, the feast of the year. The Sardine Run is the largest migration that occurs on Earth though not because of the distance traveled by the sardines (Sardinops sagax) but for the billions of these fish that take part in this race for food trying to not to be swallowed. This enormous shoal of sardines is more than 7 km long, 1.5 km wide and 30 meters deep, being perfectly visible from the air. This race for survival begins in May when the sardine eggs hatch in the cold waters of South Africa, mainly in Cape Agulhas, the southernmost point of Africa, and along the east coast of the continent. At one point they start their way feeding on huge amounts of plankton that arise from the depths of the ocean through the Mozambique Channel. This race lasts until mid-July when the surviving sardines take the Mozambique current, which will direct them to the Indian Ocean. No one knows exactly what causes the onset of this mass migration. It is believed that the water temperature must drop below 21 °C for the migration to begin, and there have been years (few, of course) in which this race did not take place without knowing the reason why. Other causes that are believed to affect the start of the Sardine Run are wind power and even atmospheric pressure. 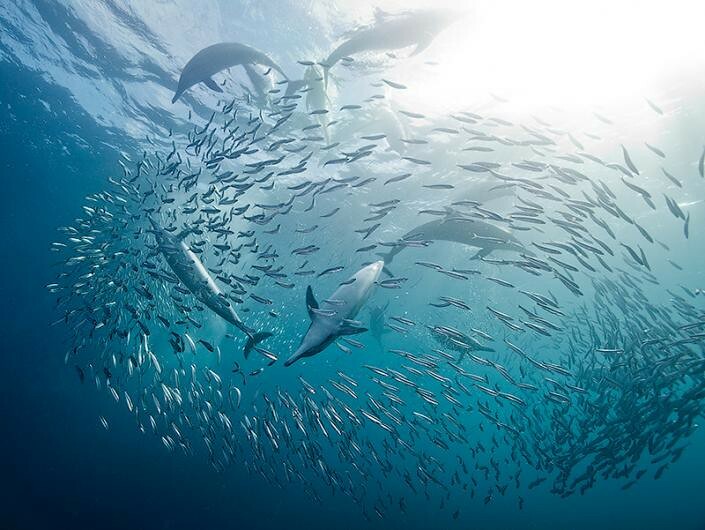 The combination of these factors mark the starting signal for this huge school of sardines to begin running towards the waters off the coast of South Africa, which grows and grows as they add new hatched members from the eggs laid in the shores of the South African province of KwaZulu-Natal. 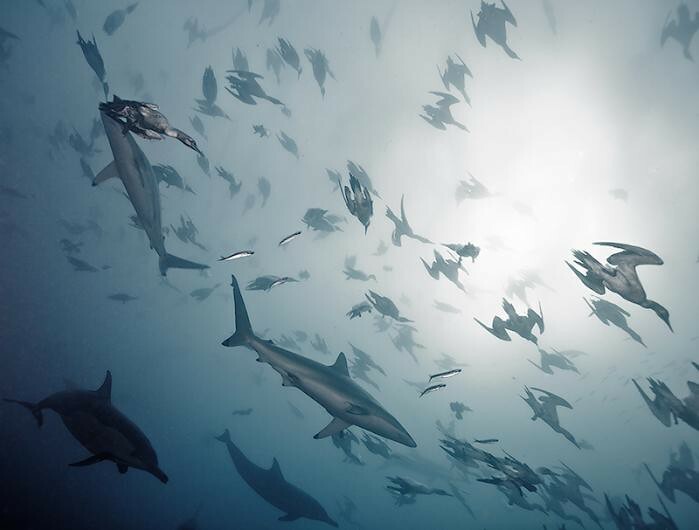 Like the wildebeest and zebras swirl in the Masai Mara and Serengeti parks as a defense mechanism against the lions, cheetahs or hyenas, sardines come together in a huge shoal trying make things difficult for ocean predators. As they progress and grow the shoal in they migration, the sardines are more packed, increasing their chances to reach the Indian Ocean and being able to survive so the species can continue ... and return to South Africa to repeat the cycle over and over again. Other reasons for sardines to join on such a big shola are enhanced foraging success, and higher success in finding a mate. It is also likely that fish benefit from shoal membership through increased hydrodynamic efficiency. The ocean predators, like lions in the African bush, know that attacking a group that large and compact requires more effort than the reward they get. The only way to get food from these groups is through a strategy as effective as natural. Have you seen documentaries where lions prepare ambushes? Have you seen how they attack the dams separating and directing them to the stronger and more experimented members of their group? Something like that happens under the surface of the South African coast, with the intelligence of dolphins at the service of many other predators. Dolphins are the reason that a simple migration becomes a spectacle of nature and are responsible for thousands of predators taking advantage of their intelligence. When the dolphins see the birds flying over the bank and watch them get out of the water to breath, it's showtime! Dolphins (estimated at 18,000 flock to this migration, especially common and bottlenose dolphins) communicate and coordinate with each other to gather sardines in great balls to have better chances to hunt them with less effort focusing on a limited number of members, like predators of the savanna. 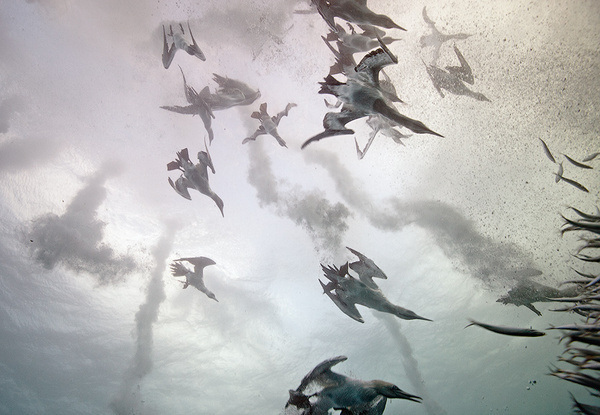 At that time, when the balls are compacted trying to defend from predators, other actors arrive: Cape cormorants (Morus capensis), shearwaters and seagulls jump into the water at 60 km/h to dive more than 20 meters deep trying to catch, at least, one sardine on every dive. Then sharks enter the scene: copper sharks (Carcharhinus brachyurus), blacktip sharks (Carcharhinus limbatus), dusky sharks (Carcharhinus obscurus), sand tiger sharks (Carcharias taurus) and spinner sharks (Carcharhinus brevipinna) crossing the schools of sardines with their open mouths open trying to capture the biggest possible amount of sardines (and it is not surprising getting a bird on the way). It may seem little food to a shark, but these sardines, Sardinops sagax, are one of the largest of the species, measuring up to 40 cm. The sardine school keeps losing members due to the onslaught until, after a maximum of 10 minutes, the fish ball disappears completely, either by the participation of all these predators or the entry of a guest star, the Bryde's whale (Balaenoptera edeni) and sometimes even humpback whales (Megaptera novaeangliae), which accelerate end of the final act. Less than 10 minutes are enough to finish a school of fish that can measure 20 meters in diameter and be 10 metters deep from the surface. To the rest of the kilometric school the process is repeated, with thousands of predators trying to weaken the group dividing it into balls to attack. 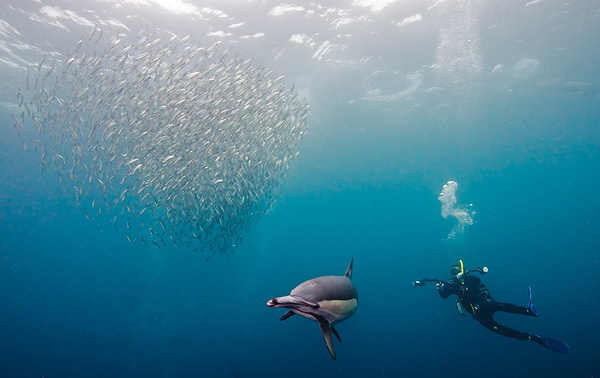 The Sardine Run is now a very popular event that thousands of divers want to see at least once in lifetime. Whether diving or snorkeling, this annual feast is having a major impact on the local economy, one of the main attractions during the winter in KwaZulu-Natal. 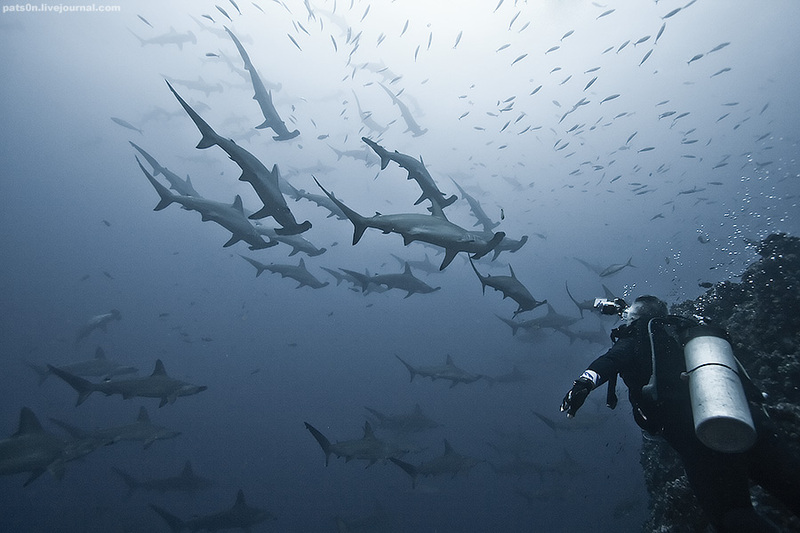 There are dozens of charters and dive trips to the Sardine Run organized directly from Europe or the United States or through diving companies in South Africa. The vast majority of them trying to get awesome underwater images like those that illustrate this post. Needless to say, it is enormously difficult to capture images such as those that our friend Dmitry Miroshnikov provided us. Groups of thousands of sardines changing direction at breakneck speeds, predators that do not notice the diver and cross the fish balls at full speed, birds falling from the sky with their sharp beaks ahead... and you have to try not to get into one of these balls which would cause a good involuntary bite. 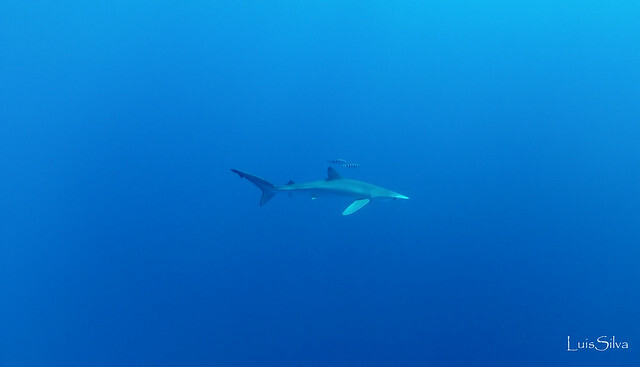 In few occasions can you be so close to such an extraordinary event in nature, living the life cycle of the ocean, being such a close witness to the fight for the survival of lots of marine species.